The Māori All Blacks, previously called the New Zealand Māori, is a rugby union team from New Zealand. A representative team of the New Zealand Rugby Union, a prerequisite for playing in this team is that the player is to have Māori whakapapa or genealogy. In the past this rule was not strictly applied; non–Māori players who looked Māori were often selected in the team. These included a few Island players and a couple of African descent. Today all players have their ancestry verified before selection in the team. The team's first match was in 1888 against Hawke's Bay, and their first international match in 1888 against Ireland in Dublin. This was followed by a tour of Europe in 1888 and 1889 where the team suffered their first Test defeat—to Wales in Swansea. The team's early uniforms consisted of a black jersey with a silver fern and white knickerbockers. New Zealand Māori perform a haka—a Māori challenge or posture dance—before each match. The haka was later adopted by the New Zealand national team, the All Blacks, as were their black shirts. In 2001, the Māori first performed the "Timatanga" haka, which describes the evolution of life and the creation of New Zealand from the four winds. The Māori All Blacks competed in the Churchill Cup, which they won in 2004 and 2006, and in the Pacific Nations Cup, which they won in 2008. In November 2012, the team played three matches in England, against Canada at Oxford University RFC, the Leicester Tigers and an RFU Championship XV consisting of English-qualified players from the second tier RFU Championship. Since being given official status in 1910, the New Zealand Maori have selected some of rugby union's great players, including fullback New Zealand from 1924–30, halfback Sid Going who played 86 matches for his country and former New Zealand captain Tane Norton, who represented New Zealand in 61 games, including 27 tests, and later became president of the New Zealand Rugby Union. The team was renamed the Maori All Blacks in 2012, having been previously called the New Zealand Maori and New Zealand Maoris. The first official New Zealand Maoris team was selected in 1910. However, the 1888 New Zealand Natives team, one of the first of New Zealand's national rugby teams and the first to wear black jerseys, was originally conceived as an all-Māori selection and ultimately included just five non-Māori players in its ranks. The team is a selection of the best of New Zealand's Māori rugby players and boasts a proud history of defeating national sides. At matches in New Zealand in 2010 to mark one hundred years of Māori All Blacks rugby, the team defeated Ireland and England, having beaten the British and Irish Lions in 2005. Many members have gone on to play for the All Blacks. The team pioneered the black jersey, the silver fern and performing a haka before kickoff, all now synonymous with New Zealand sport. In 1888–89, the 'Joseph Warbrick, promoted by Thomas Eyton, and managed by James Scott. The team played 107 matches during their tour. Although most of the matches played were Rugby football, the team also played Victorian Rules football and Association football in Australia. The squad consisted of 26 players, and they achieved a record of 78 wins, 6 draws, and 23 losses. They had success over international side, Ireland, but lost to Wales and England. The idea for a team of Māori team of footballers to tour Britain was that of Joseph Warbrick. He had initially proposed a team of Māori or part-Māori play the touring British side in 1888. 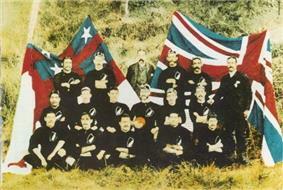 This developed into a venture to have a Māori team Britain if a preliminary tour of New Zealand was successful. After learning of Warbrick's plans, Thomas Eyton contacted him to help manage the tour. Eventually James Scott joined the partnership, and the roles of the three were decided; Warbrick as captain, Scott as manager, and Eyton as promoter. Warbrick started assembling a team for the tour in early 1888. He did have difficulties assembling a team due to player availability, and failed to secure Jack Taiaroa due to his university commitments. Some players who were available for the tour withdrew due to the inclusion of part-Māori in the team. There were twenty Māori players selected for the team. However, after the defeat to Auckland five Pakeha players were added to the team. Due to the inclusion of Pakeha players the team was renamed from the New Zealand Māori to the New Zealand Native Football Representatives. The final team consisted of 26 players including Warbrick. The team toured New Zealand before departing overseas. The team played against Hawke's Bay, Auckland, Nelson, Wellington, Canterbury, South Canterbury, and Otago. The first game was held against Hawke's Bay in Napier on 23 June 1888. They played nine games in their preliminary tour of New Zealand of which seven were won. Their last match was against Otago and was won one try to nil was played in Dunedin on 31 July 1888. The team departed for Australia from Dunedin on 1 August 1888. The team arrived in Melbourne where Scott recruited a Victorian Rules coach Jack Lawlor to coach the team while they were in Britain for possible Victorian Rules matches on their return to Australia. The team did play two matches while in Melbourne; both were rugby matches against the Melbourne Rugby Union team with the first won, and the second a draw They departed from Melbourne to Britain via Suez. The team arrived in London on 27 September 1888. 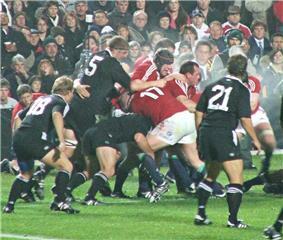 New Zealand has a long history of sporting contact with South Africa, especially through rugby union. Until the 1970s this resulted in discrimination against Māori players, since the apartheid political system in South Africa for most of the twentieth century did not allow people of different races to play sport together, and therefore South African officials requested that Māori players not be included in sides which toured their country. Despite some of New Zealand's best players being Māori, this was agreed to, and Māori were excluded from tours of South Africa, including the Māori All Blacks. Nonetheless in the early period, South Africa did play the Māori All Blacks. In April 2010 it was revealed by Muru Walters that in 1956 Ernest Corbett, Minister of Māori Affairs, had told the team to deliberately lose to the Springboks "for the future of rugby". The Māori team lost 37-0. This was followed by Walters calling for the New Zealand government to apologise for the way it treated Māori rugby players. The professional era in Māori rugby union began in 1994, marked the team lost only four of its 26 games played between 1994 and 2004, including beating England, Argentina, Scotland and Fiji. The Māori continued their winning form in 2004 beating the England Saxons in extra time in the final of the Churchill Cup in Canada. One of their two annual tournaments is a competition involving the Pacific top national teams, the Pacific Nations Cup. From 2008 they replaced the Junior All Blacks, where they were undefeated champions, narrowly beating Australia A in the final game of the tournament. The Churchill Cup was another, winning in 2004 after they returned to the competition in 2006, defeating Ireland A and the USA in pool play in Santa Clara, California and Scotland A in the final in Edmonton, Alberta. In 2005 the Māori beat the British and Irish Lions for the first time in an official match. Their preparations for this match forced them to withdraw from the 2005 Churchill Cup. In August 2012, NZRU announced the Māori All Blacks would play three matches in the United Kingdom, including an international fixture against Canada. Jamie Joseph was coach with assistance from Daryl Gibson. Performing the haka prior to their match against the United States in 2013. One of the New Zealand Natives' greatest legacies was the haka, a traditional Māori posture dance with vigorous movements and stamping of the feet, to the accompaniment of rhythmically shouted words; this was first performed during a match on 3 October 1888 against Surrey in England, United Kingdom. The haka was later adopted by the New Zealand national team, the All Blacks. In 2001, the Māori first performed the "Timatanga" haka, which describes the evolution of life and the creation of New Zealand from the four winds. This dramatic haka, Timatanga, was written especially for the New Zealand Maori team by team kaumātua (elder) Whetu Tipiwai. It tells the Maori story of the creation from the void, the nothingness, the darkness to what we have today. It also tells of a gathering of young warriors, young chiefs, young rugby players who are making a statement and setting aims, objectives and strategies to achieve matauranga (knowledge), whanaunatanga (unity) and taumatatanga (excellence). This is not only for the present but for the future of Maori rugby and each individual’s mana (prestige), whanau (family), hapu (sub-tribe) and iwi (tribe). This will increase their oranga (well-being) both wairua (spiritually), hinengaro (mentally) and tinana (physically). New Zealand Māori matches against international sides from 1996 till present, including the New Zealand Natives 1888 and 1889 tour. These results are only against full international sides, including the British and Irish Lions. Not against second national teams. New Zealand Māori 32-man squad their match against Fiji on 11 July and the match against the New Zealand Barbarians on 18 July. Note: Bold denotes players that have represented the Māori All Blacks in previous tours. Note: Flags indicate national union as has been defined under IRB eligibility rules. Players may hold more than one non-IRB nationality. ^ "Rugby: Maori told to throw match against Boks". ^ "Maori AllBlacks to tour United Kingdom | allblacks.com – official site of the All Blacks". allblacks.com. 30 August 2012. Retrieved 2012-09-29. ^ "NZ Maori first class results 1910-May 2010". All Blacks. Allblacks.com. 23 June 2010. Retrieved 14 November 2013.